1. Would you rather lose all of your mascaras, eyeliners, lipsticks and lip glosses or lose all of your palettes and eye shadows? Never be able to cut it again. I like my long hair - more hairstyles to try! Both ideas horrify me :P But I guess eyeliner as lipstick because lipstick would be super sticky and uncomfortable on the eyelids! Sephora. There are more brands available which means a wider variety of products! 7. 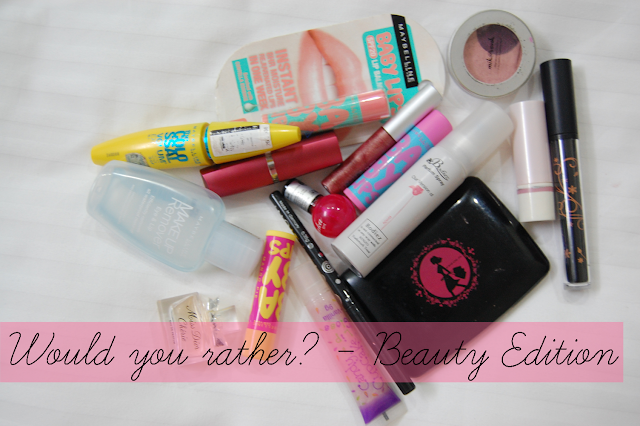 Would you rather only use one eye shadow colour or one lip colour for the rest of your life? One eye shadow colour for the rest of my life. I only really use pale pink or sandy brown everyday anyway and am much to scared to experiment in that area :P Changing up lip colour is much simpler. Summer clothes in winter. I can just pile on the layers - that's not cheating right - and wearing something simple like tights underneath for added warmth. 9. Would you rather dark nails or bright nails all year round? Pony tail. Somehow, my messy bun always falls out eventually. 12. Would you rather never being able to paint your nails again or never use lip gloss? With school, I hardly ever paint my nails anyway and although I'm not a huge lip gloss fan, I'd have more opportunities using that. 13. Would you rather shave your eyebrows and have none at all? or sharpie them in everyday? Both horrific thoughts. I think sharpie them in everyday. The sight of my without eyebrows would be hilarious. Without nail polish, I don't mind if they go bare and I hardly wear it. I tag everyone that read this and would love to see your answers to them so do leave your links in the comments below if you have!